Recognition of chronic kidney disease (CKD) may be improved by electronic glomerular filtration rate (eGFR) reporting. The National Kidney Foundation Kidney Disease Outcomes Quality Initiative (K/DOQI) provides recommendations on quantitative evaluation for proteinuria, prescription of angiotensin‐converting enzyme inhibitors/angiotensin receptor blockers (ACEIs/ARBs) in selected patients and consultation with a nephrologist in later‐stage disease. Hospitalists frequently manage patients with CKD, but little is known about the effectiveness of eGFR reporting and compliance with K/DOQI guidelines in the inpatient setting. The goal of this study was to evaluate how often CKD was recognized on an inpatient medical service after eGFR implementation and how often evidence‐based practices from the K/DOQI guidelines were followed in patients with stages 3–5 disease. The reporting of eGFR with every chemistry panel was implemented in February 2007 at our institution. 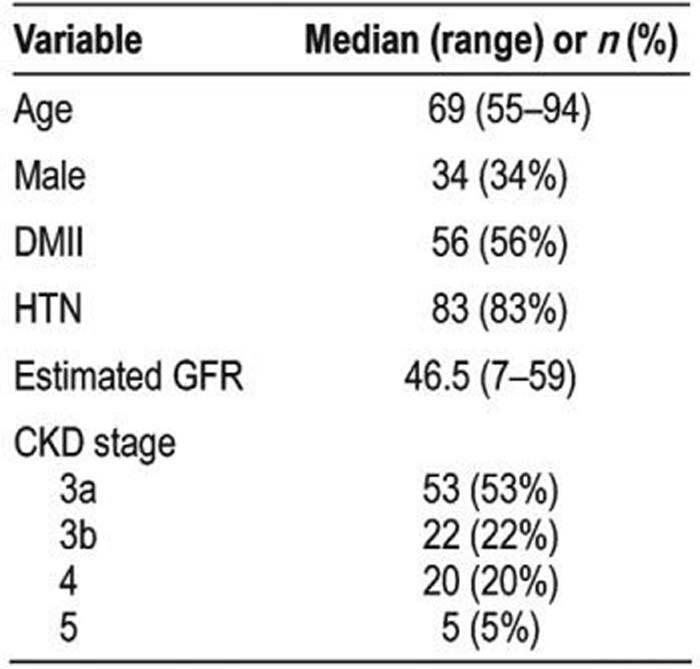 Patients admitted to the internal medicine service with CKD stages 3 through 5 were identified based on an eGFR < 60 mL/min/1.73 m2 with the exclusion of patients with acute kidney injury. Recognition of CKD was defined as documentation in the discharge summary. Proteinuria evaluation was defined by the presence of a spot urine protein–to–creatinine ratio or a timed urinary protein collection within the 12 months prior to or during hospital admission. One hundred patients were included in the analysis. Demographics are shown in Table 1. Approximately 55% of patients had a preexisting diagnosis of CKD. Only 20% of those without a preexisting diagnosis were recognized during hospitalization. Prior to admission, only 47% of patients received ACEI/ARB therapy, and this was minimally increased to 55% on discharge. Proteinuria evaluation was obtained in 47% of patients. Nephrology consultation was requested for 14% of patients during hospitalization, and 21% of patients were referred on discharge. Only 32% of stages 4 and 5 patients were referred on discharge. Nephrology consultation during hospital admission was associated with increased rates of proteinuria evaluation (log OR 2.43, P < .03). Recognition of CKD continues to be problematic despite eGFR reporting. Evidence‐based best practices are followed in the inpatient setting relatively infrequently. Implementation of computer‐based algorithms for the management of CKD in hospitalized patients may be a strategy to improve compliance with evidence‐based guidelines. G. Abra, none; L. Awdishu, none; E. Fink, none; G. Seymann, none. Abra G, Awdishu L, Fink E, Seymann G. Recognition and Treatment of Chronic Kidney Disease by Hospitalists Post‐Electronic GFR Reporting. Abstract published at Hospital Medicine 2009, May 14-17, Chicago, Ill. Abstract 2. Journal of Hospital Medicine. 2009; 4 (suppl 1). https://www.shmabstracts.com/abstract/recognition-and-treatment-of-chronic-kidney-disease-by-hospitalists-postelectronic-gfr-reporting/. Accessed April 25, 2019.